If you need help fighting your Careless Driving, Stunt Driving, Speeding Ticket or any other traffic tickets from Windsor (and anywhere else in Ontario), call Ticket Defenders®* - the specialists on traffic ticket defence in Windsor. 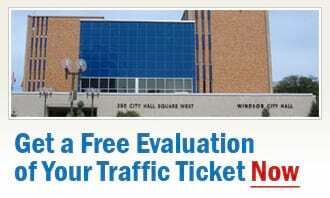 We are supervised and operated by former senior Traffic Court Prosecutors. Our education and experience is unsurpassed by anyone. We can help you by providing a free, no-obligation traffic ticket consultation at our office, over the phone, or by e-mail or fax - in whatever way you prefer. Please note that after 15 years at Tecumseh Rd., our offices have now been re-located. Free onsite parking - please call 1‑866‑801‑8299 first to book an appointment. We service non-commercial drivers, as well as professional drivers and MTO matters in both Canada and United States. We specialize in the defence of any traffic tickets, including driving with Careless Driving Charge, Stunt Driving Ticket, Speeding Tickets, no insurance, driving under suspension etc. Let us give you free and candid advice about your chances for successful traffic ticket defence in Windsor Court, and protecting your demerit points. Protect your insurance premiums. Don't incur demerit points. Remember that there is help: don't pay your traffic tickets from Windsor before you talk to us, Ticket Defenders®* - the most successful team of experts on traffic ticket defence in Windsor and all of Ontario.